Production Company: Caulfield Photoplay Co. Producer: Al Christie. Director: Scott Sidney. Cast: Elinor Field (Winnie), Cullen Landis (Jack), Billy Bevan (Father). Transfer Note: Copied at 18 frames per second from a 35mm print preserved by the Library of Congress from source material provided by EYE Filmmuseum. New Music: Stephen Horne. Running Time: 10 minutes. Although Cupid in Quarantine was released under the brand name Strand Comedies, it’s really a “Christie Comedy” — produced and supervised by Al Christie. Along with Mack Sennett and Hal Roach, Christie was one of the biggest producers of comedy in the silent era. While he isn’t as well-known as his two main competitors, he put out quality short subjects for 30 years. The Canadian-born born Christie started his career as a stage manager for various touring shows, but by 1907 he was working as general manager of David Horsely’s Centaur Film Co. When Horsely organized Nestor Films in 1910, Christie became its director and turned out a stream of westerns and comedies. To get away from the Motion Picture Patent’s Trust, the company moved from the East Coast to California in 1911 and became one of Hollywood’s first studios. A distribution deal with Universal kept Christie turning out an average of two one-reelers a week. Although head of the Nestor unit, he severed his connection in 1916 and set up an independent company with his brother Charles. Starting small they quickly expanded, and in addition to their name brand they also turned out Strand, Cub, and Supreme Comedies. The Strand unit was set up in 1917 for the Caulfield Photoplay Co., with distribution through Mutual. The shorts were one-reel domestic comedies, usually about young couples and the trials and tribulations of their relationships, and more than a hundred were produced before the series ended in 1919. 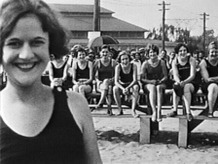 The bulk of the Strands were directed by Scott Sidney, and the casts included Christie regulars like Billie Rhodes, Harry Depp, Gertrude Selby, and Cupid in Quarantine’s couple Elinor Field and Cullen Landis. Field had been a Mack Sennett Bathing Beauty. Hired by Christie, she was a leading lady for Bobby Vernon before becoming a Strand female lead. She later appeared in features and had the title role in Selig’s serial The Jungle Goddess (1922). Landis did odd studio jobs like driving a truck and operating a phone switchboard before making his on-camera debut for Balboa in 1916. By the next year he’d joined the company at Strand, and in 1919 he jumped to features for Goldwyn supporting Mabel Normand, Will Rogers, and Lon Chaney. He was busy in features all through the 1920s; one of his last pictures was the early all-talkie feature Lights of New York (1928). Retiring from acting in 1930, he made military training films during World War II. Many character roles in the Strands were played by Billy Bevan, who here gets the lion’s share of footage as Elinor’s feisty father. Best remembered for his string of starring 1920s comedies for Mack Sennett, Bevan had been a child actor with the touring Australian company Pollard’s Lilliputians, and worked in American vaudeville and musical comedy. Making his film debut in 1916 with L-Ko Comedies, he moved around to Fox Sunshine and Century before being hired by Sennett in 1919. Bevan became identified with a big brush mustache, a derby, and a breezy personality in gag-oriented, surreal slapstick shorts like The Iron Nag (1925) and Ice Cold Cocos (1926). Later becoming a busy character actor in sound pictures, Bevan was one of Hollywood’s favorite cockneys in movies like The Long Voyage Home (1940) and Cluny Brown (1946) until his retirement in 1950. The peak of Al Christie’s career was the 1920s, when he released his films through Educational and Paramount with stars like Bobby Vernon, Dorothy Devore, Neal Burns, Jack Duffy, and Billy Dooley. When sound arrived Christie dove right in — but the new medium didn’t treat him very well. The combination of changes in the industry and the Depression drove the Christie brothers into bankruptcy. Christie went on to work for Educational Pictures, becoming supervisor for its East Coast productions and overseeing shorts with New York stage people like Joe Cook, Bert Lahr, and Danny Kaye. When Educational closed at the end of the 1930s he had trouble finding work, and after 35 years he retired from films to work for the Douglas Aircraft Company until his death in 1951. —Steve Massa, film historian and author of Slapstick Divas: The Women of Silent Comedy and Lame Brains and Lunatics: The Good, the Bad, and the Forgotten of Silent Comedy. Cupid in Quarantine was preserved in 2018 at Colorlab. Corp using the only known surviving element: a 35mm nitrate print from EYE Filmmuseum. The intertitles were translated from the Dutch and are modern re-creations. The work was supervised by the Library of Congress with funding provided by “For the Love of Film”: The Film Preservation Blogathon (May 13–17, 2015). The new music for this presentation was composed and performed by Stephen Horne. A house pianist at London’s BFI Southbank for thirty years, he has played at all the major UK venues and recorded music for many DVD releases of silent films. He regularly performs at film festivals across the world, from Pordenone to Shanghai. Among his prior NFPF projects are accompaniments featured in the DVDs Treasures III: Social Issues in American Film and Treasures 5: The West.